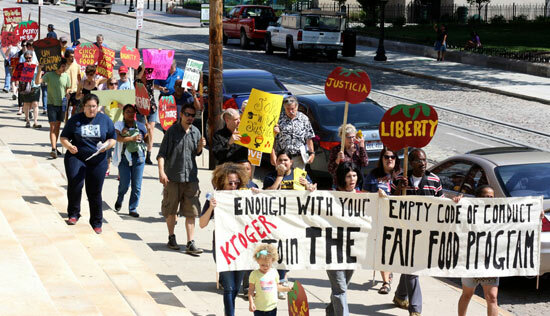 CIW, Fair Food allies to rally outside Kroger annual shareholder meeting Thursday in Cincinnati! 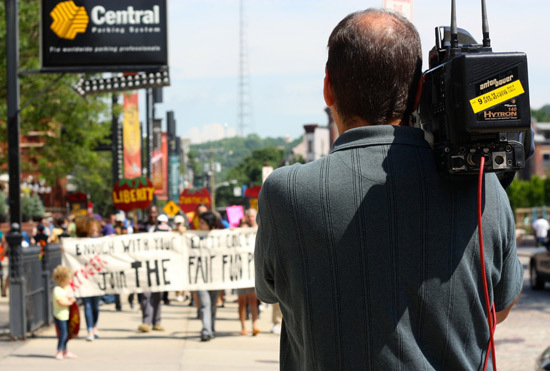 CIW members and their Ohio-based allies march through downtown Cincinnati after representatives were shut out of last year’s Kroger shareholder meeting. On Thursday, June 24th, in Cincinnati, Ohio, local clergy, students, and residents with the Cincinnati Interfaith Workers Center and Ohio Fair Food will join the Coalition of Immokalee Workers (CIW) for a demonstration outside the 2015 Kroger’s Annual Meeting of Shareholders. Together, they will call on the supermarket giant to join its competitors Walmart, Whole Foods, Trader Joe’s and Fresh Market in supporting the award-winning Fair Food Program. Mother Paula Jackson: “As a person of faith and local Cincinnati resident, I am deeply dismayed by the unconscionable refusal of Kroger’s to join a mechanism that is successfully rooting out such longstanding abuses,” said Mother Paula Jackson of the Church of our Savior. For those of you in the Cincinnati area, the rally will begin at 10:00 am outside the city’s Music Hall, 1241 Elm St. Check back soon for a complete update from the rally, with photos and a first-hand report from inside the meeting! Meanwhile, the CIW’s worker-to-worker education team continues to make its way up the east coast, as the expansion of the Fair Food Program reaches South Carolina’s coastal tomato industry. But while the task at hand — informing workers on participating Low Country tomato farms of their rights under the Fair Food Program — is of utmost importance, events in Charleston this week shook the country as a whole and transcended the education team’s mission. Accordingly, the team members decided to set aside their work yesterday to visit Mother Emanuel AME Church and pay their respects to the victims of last Wednesday’s horrific shooting. 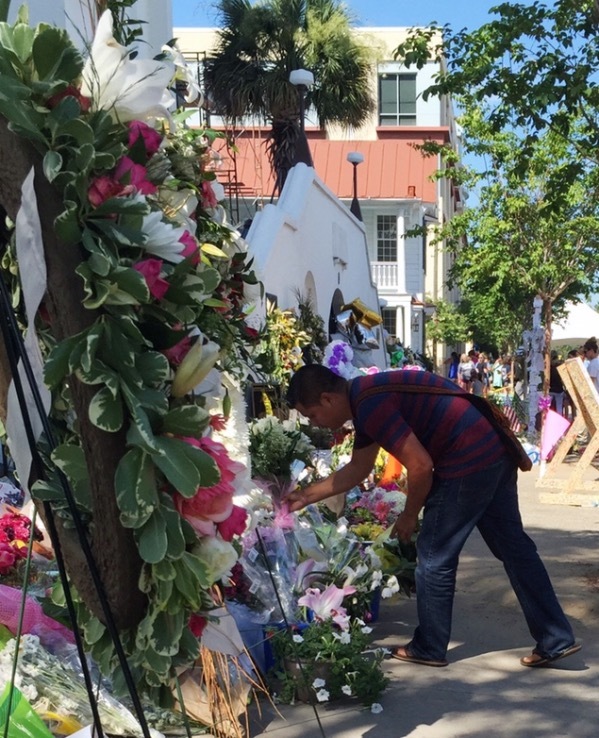 The CIW’s Cruz Salucio lays flowers outside Charleston’s Mother Emanuel Church on behalf of his fellow CIW members. Nothing can be said or done today to bring back the nine souls lost in last week’s attack, nor to fill the hole left by their loss in the lives of their countless loved ones. They can no longer hug or hold, laugh or cry with, their husbands and wives, sons and daughters, fathers and mothers, who died that day at prayer. But their loss will not be in vain. If the current movement to relegate the Confederate flag — that hateful image finally being recognized as the symbol of oppression and division it has always truly been — to the dustbin of history is any indication, this event has shaken the South out of its ancient stupor and awoken an entire region to the reality that hate, and its vile offspring, racism, have no place in the 21st century. But the flag’s removal should be just a start. It is up to us now, those left behind in the wake of Wednesday’s nightmare, to go deeper, to finally uproot the age old contempt and cruelty for which it stood. As the Reverend Norvel Goff declared at this past Sunday’s service at the Emanuel AME Church, “no weapon formed against us shall prosper.” Hate, the most deadly weapon of all, shall not prosper. Love must, and will, prevail. BREAKING: Ben & Jerry’s commits to work with Vermont dairy workers toward agreement to adopt Milk with Dignity Program in company’s Northeast dairy supply chain! NEW VIDEO: What is Worker-driven Social Responsibility?